There's no scarcity of great train trips to take in the fall. There are beer trains through the mountains and wine trains through fall foliage. You can find a themed train for just about anything you're looking for, including Halloween. 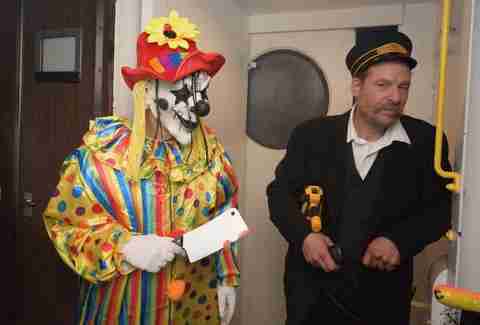 The Catskill Mountain Railroad has launched a new ride called Rails of Terror. It's a haunted house on rails that runs through the Hudson Valley. It's part fright trail, part history of the region in ghost stories that can be enjoyed from your seat aboard the train. 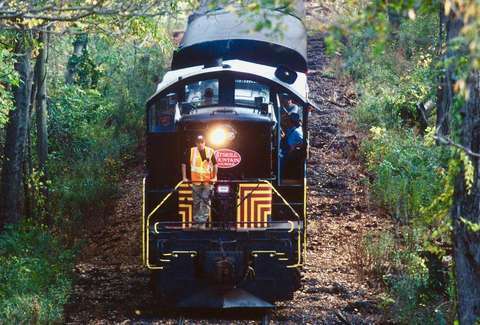 "You drive by it, or the action is on the train with [visitors]," Rob Gaston of Catskill Mountain Railroad tells Thrillist. Many of the characters visitors encounter are taken from folklore and tales of the region. Rails of Terror is hosted by Lady Eloise, the ghost of a woman hit by a train on her way to a dance in the 1950s. "She's really lovely and appears to people from time to time," Gaston said, before adding, "She's light on her feet." The character hosts the guided hour-long tour, which departs from Kingston, New York and heads north through the Hudson Valley before turning back. The stories also have a strong connection to the Salem Witch Trials. "There was a flood of people who came to this area because New York was an asylum for those who were being persecuted in the 1690s as witches," Gaston said. "New York became a witch haven." It's awfully nice of the Catskill Mountain Railroad to give some ghosts a platform to tell their stories, but if you want to see scary things express themselves, you'll have to do it soon. Rails of Terror only runs on Fridays and Saturday through the end of October.